Almost done with a leave drawing, did a "quickie". A lot has been happening around the house (painting & residing) and personal affairs that have kept me from the drawing table. But the Grape Leaves is brought to an almost finished state. I pinned it to the wall for evaluation and saw that the weathered white window frame needs to be made lighter (showing less of the tan background paper). For a change I did a quick, small drawing of an oak leaf on black paper. This I did with the Derwent drawing pencils whose color range is perfect for this kind of subject. The weather has turned cold and windy this past weekend, the start of Oktoberfest here in La Crosse. The cold weather has kept the festers indoors. I recently splurged and bought set of Derwent Tinted charcoal pencils and Derwent Drawing pencils. The Tinted charcoal have various earth tones blended with the charcoal for subtle color. 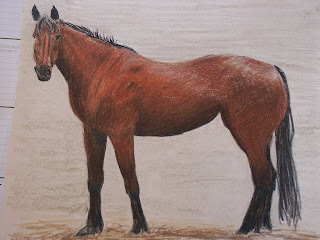 I experimented with a drawing of a bay horse. I drew it freehand from the source photo without my usual gridding. So the figure didn't get very well placed. But it didn't matter since this was practice for the Tinted charcoal. I don't usually draw with charcoal so I ended up treating the pencils like pastel pencils. I will need to practice with straight charcoal to better use this medium. The Derwent Drawing pencils are thick leaded colored pencils in a range of earth tones. They are very soft and pleasant to use. I drew the horse freehand again but with better placement. I just need to practice without the grid. The drawing pencils were finished with a Prismacolor colorless blender. I will be planning some drawings that will use this limited range of earth tones. 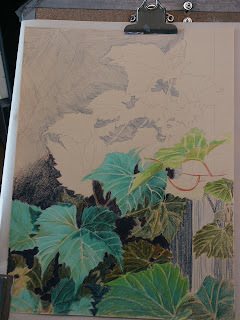 I am also in progress on another leaf drawing. These are wild grape leaves in an old window. The paper is 16 x 12 tan Canson Mi-tientes. I have made the adjustments needed. Compare it with the pictures in the previous post and compare them. The shadows definately have improve things. The "Bangor Feedmill" is done but not finished. I posted it to the Critique forum at "Wet Canvas" and received valuable advice on cropping to make a better picture. In the computer I trimmed at recommended, broke up the foreground shadow and added the tree on the right. Now I have to do it sometime.